Yes, he’s a dad. We let them sneak on occasionally just to make the place look purty. .
A ‘dip’ recipe but makes a nice thick and clingy spread, so, it can be put on rice cakes, toast or used as sandwich filling. 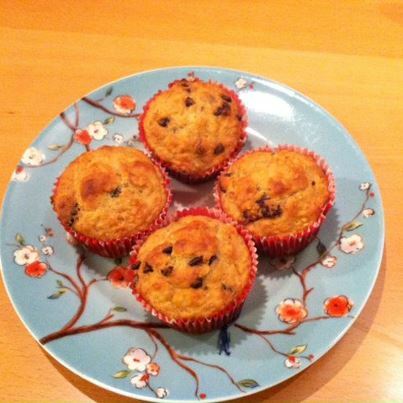 Another muffin recipe for you! The original recipe is in cups but I have done my best to give weight conversions but they might be a little iffy. I freeze these and they are a staple picnic food. Preheat oven to 200 C or 190 for fan ovens. Put rack just below middle of oven. Cook broccoli (boiled or steamed until tender). 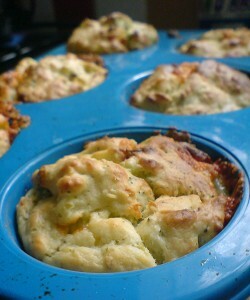 Spray muffin tins with non-stick spray. Using two spoons divide the mixture evenly between the pans. Bake for 12/15 minutes or until golden-brown and centres spring back when pressed. Let the muffins cool in the pans for 2-3 minutes before tipping out. A yummy adult version or for older kids is to use a creamy blue cheese instead of cheddar. Mix all the dry ingredients, then mix the wet ones together and stir into flour/polenta/baking powder. Add the corn at the end. Bake in muffin tins at 160c for about 25-30mins until golden brown on top. Results from my first try – they came out really well, a dense, yellowy bread – they’re tasty, but probably best as an accompaniment to something. For adults, they’re probably great bbq food. They’d be nice with soup too. Little people could dip in and enjoy! They’re best warm but could be frozen then heated in the microwave. But I discovered you can put small lumps of bread dough in it and make little round bread shells which you can fill with cream cheese and salmon etc for babies) and they are just the perfect size for grabbing. They are also pretty cool for transporting because you can make up the shells using two of them, put them in a pot and take them with you (although you get the same amount of mess out as home – but hey, hopefully it’s on someone else’s floor so you don’t have to clear up). 1. Preheat the oven to 220C/425F/Gas 7. 2. Place the cooked rice into a large bowl. Stir in the beaten egg along with the spring onions, pepper and soy sauce. 3. Heat the oil in a small to medium non-stick frying pan. Spoon the rice mixture into the pan and press down. Fry for about two minutes. Transfer the pan to the oven and cook for a further 10-12 minutes. 4. Remove from the oven and allow to cool slightly. Turn the cake out and cut into wedges to serve. Although lovely the next time I would add more ingredients (maybe garlic, some herbs or veggies or ginger) to give it some more taste, but definitely a good base recipe, oh and for those of us who don’t have every chefs implement known to man, I cooked it in a frying pan and transfered it to an oven proof dish. the flour in with a sieve) and mix again. Bake for 20-25 min (test at 20). The recipe can be halved to make 12 small ‘cupcakes’. On it’s own, the recipe isn’t very sweet, so I always add loads (4+) of big overripe bananas, roughly mashed or blended – also makes a yummy banana bread in a loaf tin (around 45 min). I also replace a little milk with creme fraiche for banana bread. The bananas make the texture nice and moist, like a pudding. Then do what you want with fruit, e.g. blueberries, apples, chopped dates, grated carrot, ground nuts, cinnamon, nutmeg, vanilla – anything you can think of! PS This post was amended because there was perhaps the teensiest error re the baking powder, see below for comments.